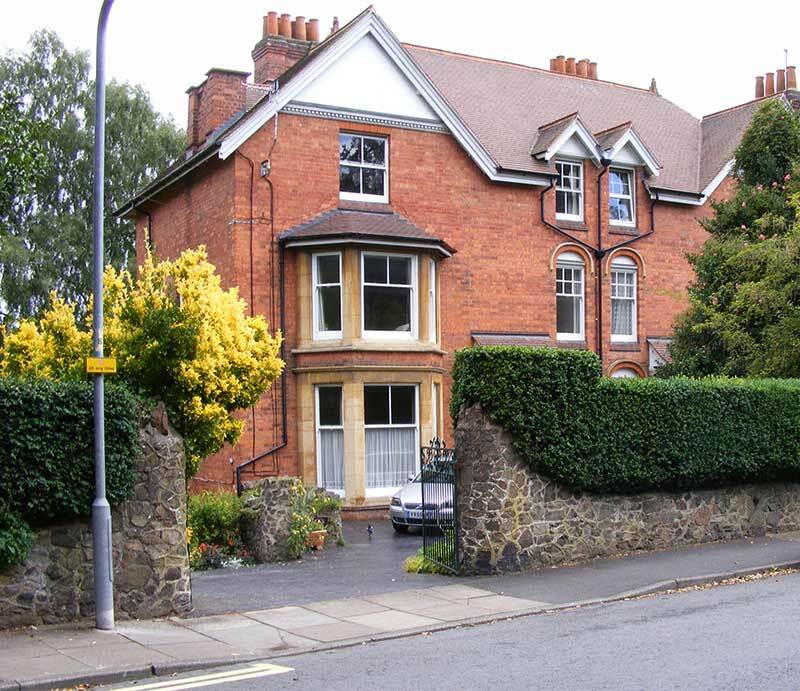 We thought we would write about the buildings in Priory Road, Great Malvern, and decided to attempt this by creating a new illustrated directory, referring back to Stevens Directory of 1911; in a similar manner to which we recorded 'Graham Road', then and now. The names of properties in 1911 were not always the original names, and some of the names have changed many times since then; we have attempted to indicate name changes where possible, and to mention some former notable residents. Our directory is not intended to be an up to date residential and business directory, but an attempt to indicate how the properties and occupants have changed over the years. 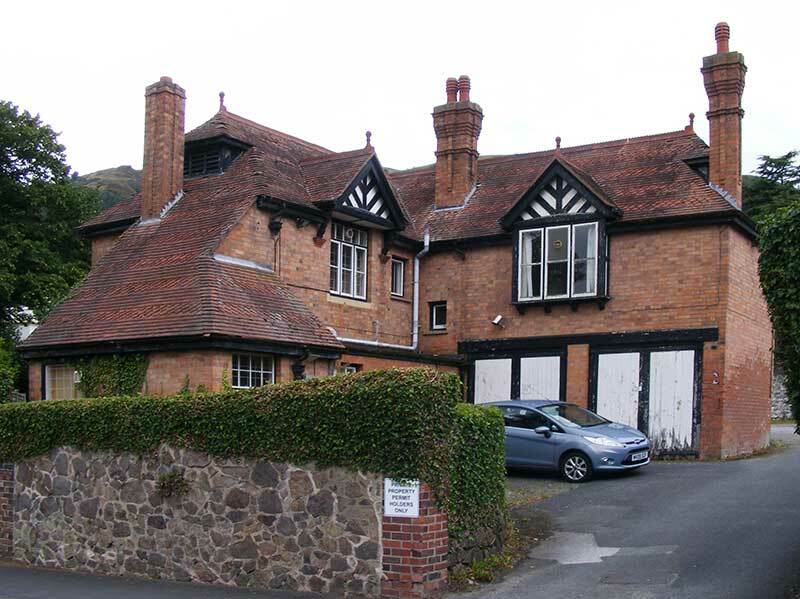 Nowadays Priory Park Mansion is occupied by Malvern Hills District Council. The present property was built by the Speer family replacing the home of water cure doctor James Manby Gully MD. In 1911 the building was leased to Ebeneezer Lloyd Jones who was running a school for young gentlemen. 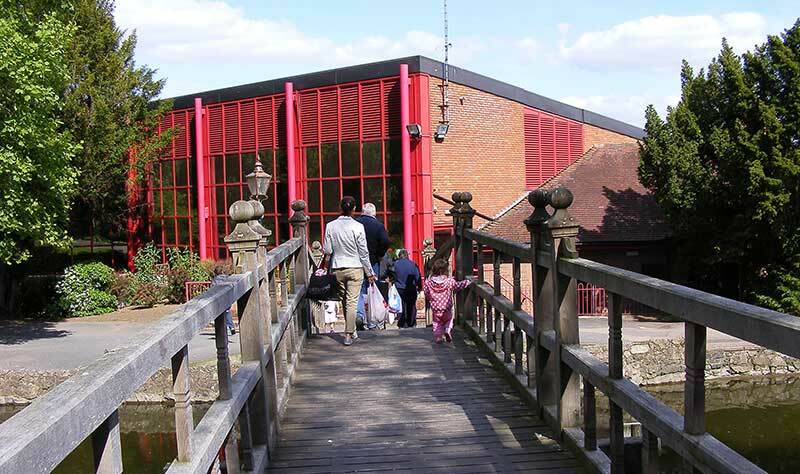 Lloyd Jones had a gymnasium added, sometimes referred to as the 'Cricket Pavilion' where council meetings are still held, and an open air swimming pool. The open air swimming pool has been replaced by the all weather Splash Leisure Centre. Next come two properties opposite Southlea car park with a council depot or yard on the land behind; once there had been greenhouses. In 2016, MHDC sold the properties, without inviting competitive bids, to IE Developments, and have given approval in 2017 for the site to be redeveloped (17/00999/FUL). IE Developments propose to retain and modernise Priory Cottage which is the older of the two buildings. In 1911 the occupant of Priory Cottage was a Miss Pitt. The larger house next to the Splash is probably the property recorded in the 1911 census as Pembroke which was then the home of Rev William James Povey, MA, a founder and first minister of the Baptist Church in Abbey Road. Very sadly this charming house with ornamental Sussex tiling is soon to be demolished by IE Developments after years of neglect by MHDC. Pembroke is not shown on the 1884 map of Great Malvern, so may have been built around 1900. In 1940 Pembroke was occupied by Rev John Smyth MA. Spa Cottage, 14 Priory Road, next door adjacent to the footpath leading from Southlea car park to Priory Park is shown on the 1884 map but for some reason is not listed in Stevens Directory. Next is Oakdale a white castellated villa largely hidden behind shrubbery. Occupied in 1911 by a Miss Stanhope. 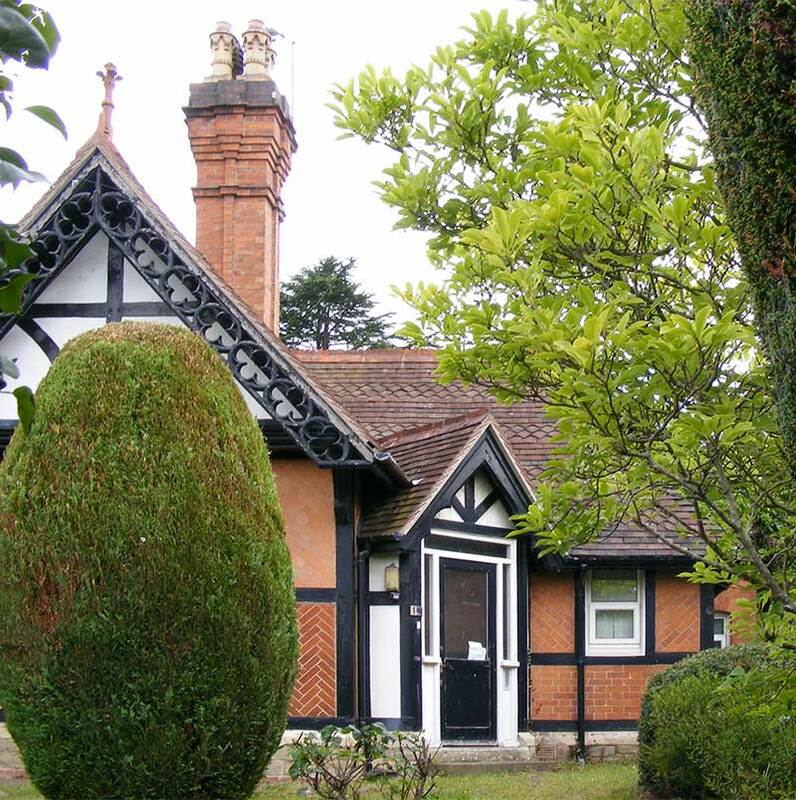 In 1940 the house was occupied by John Cecil Smyth MBE, MD, MRCS, LRCP, physician and surgeon. John Cecil Smyth MD had been awarded the MBE in 1919 for services as Commandant and Medical Officer at Fairfield Auxiliary Hospital, Malvern. We think Fairfield stood on the Worcester Road near the present Morgan Court. In 1911 Fairfield had been occupied by a boys' prep school run by Edward Capel Smith; the census listed Fairfield as having 22 rooms. Early-mid C19. Formerly the Spa House. Gothic style, crenellated. 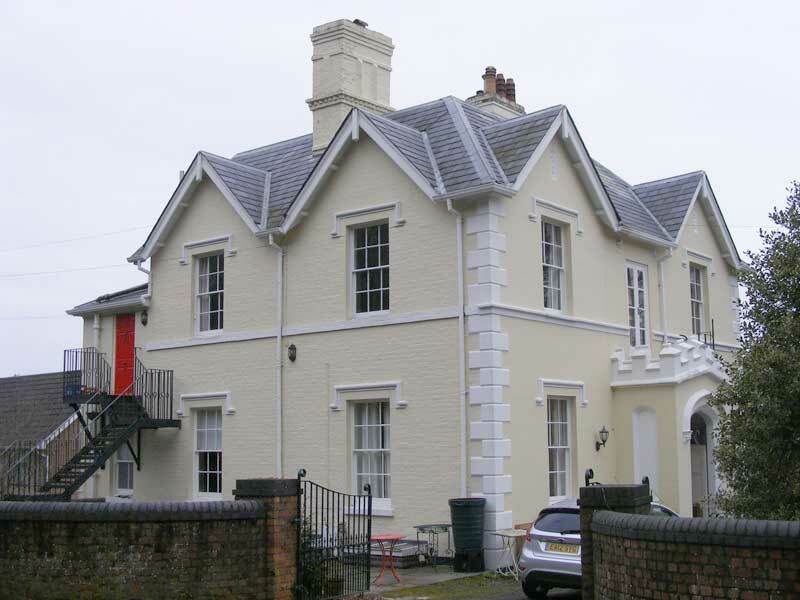 Three storeys in stucco with slate roof. Irregular elevations include battlemented octagonal turret. Various windows, square-headed with rectangular dripmoulds, pointed-arched with arched dripmoulds and Gothic glazing. Moulded 4-centred arched doorway. Centre chimney. Oakdale is recorded on the 1884 map of Malvern. 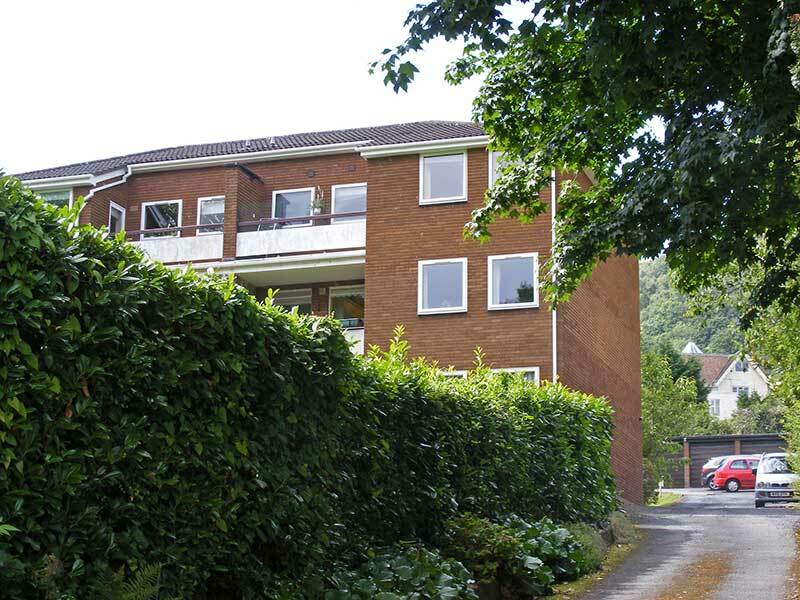 Next is Clarendon Court, modern infill, a block of apartments. We think Wentworth House may be one of the oldest properties in Priory Road. In 1940 the house was occupied by retired clergyman Rev Watkin Wynn Williams, MA who died at Wentworth House on 22nd June 1944. Paul Ferris has written a detailed account of earlier occupants which can be found on the Malvern History page of Facebook (dated 27th February 2019). 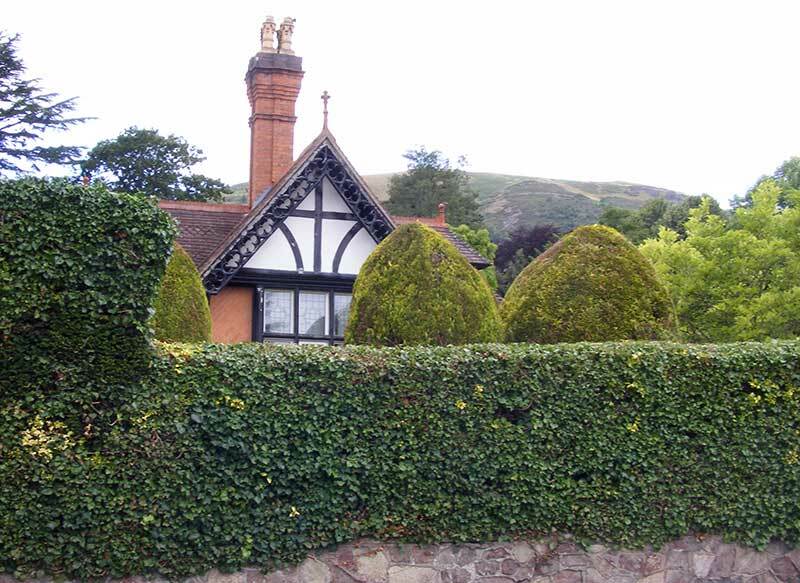 He relates that the first owner was a Lady Catherine Maunsell who was recorded in Malvern in 1859 and died at Wentworth in 1864. She was the youngest daughter of Irish Peer and MP William Hare. 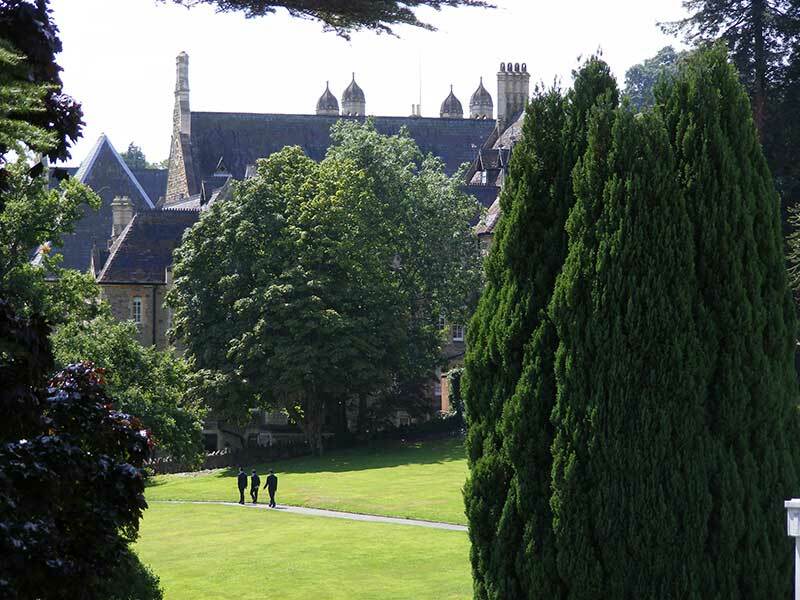 From 1877 to 1885 the property was a lodging house; then in 1891 Rev John Willis Kearns (1862 - 1962) was in residence who taught at Malvern College between1894 and 1897 before becoming Headmaster of Monkton Combe School in Bath 1900 - 1925. His wife Edith of 14 The Lees, Malvern died at St Edwards Nursing Home, British Camp, Colwall in 1959, suggesting the couple may have retired to Malvern. 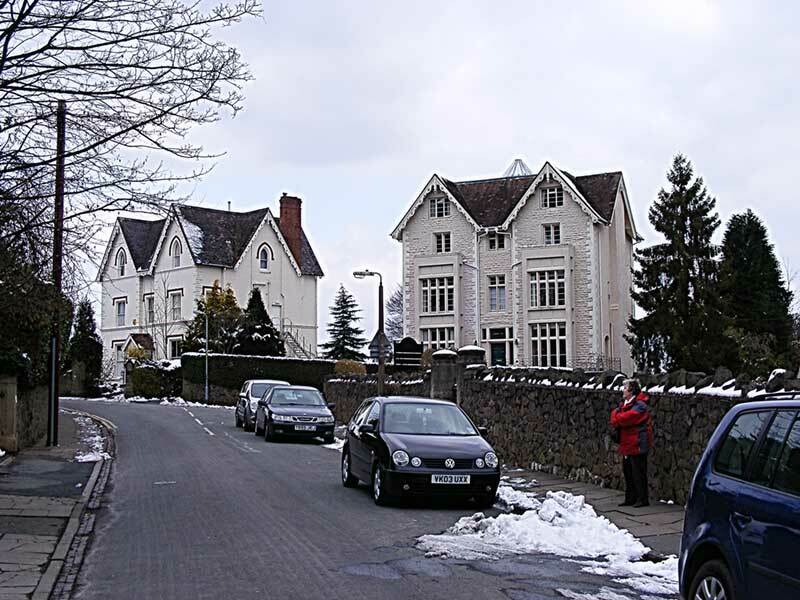 Next is a white villa named Scarsdale, now divided into flats. The 1911 census records her as a spinster of private means born London about 1840 with a parlour maid, cook, housemaid and lady's maid. The house is recorded as having 14 rooms. Visiting her in 1901 were Alfred Shuttleworth, described as an artist, and his wife Louisa. In 1911 Alfred is living a short distance away at The Palms in Orchard Road, where he is described as the Principal of a School of Art, working for the Urban District Council. Elizabeth Hinds Clarke died in 1927 and was buried in Great Malvern Cemetery. Her father George Elliott Clarke, died 1877, was a landed proprietor, who was born Barbados, West Indies, about 1813. George was the beneficiary of money from slavery, through his father Forster Clarke, and had owned the Stepney Estate in Barbados. Malvernhurst stands back from the road and was once used as a school. You can read her story on our page Malvern schools then and now. Next door down a drive and hidden behind hedges lies Greenbank Cottage 26c Priory Road. 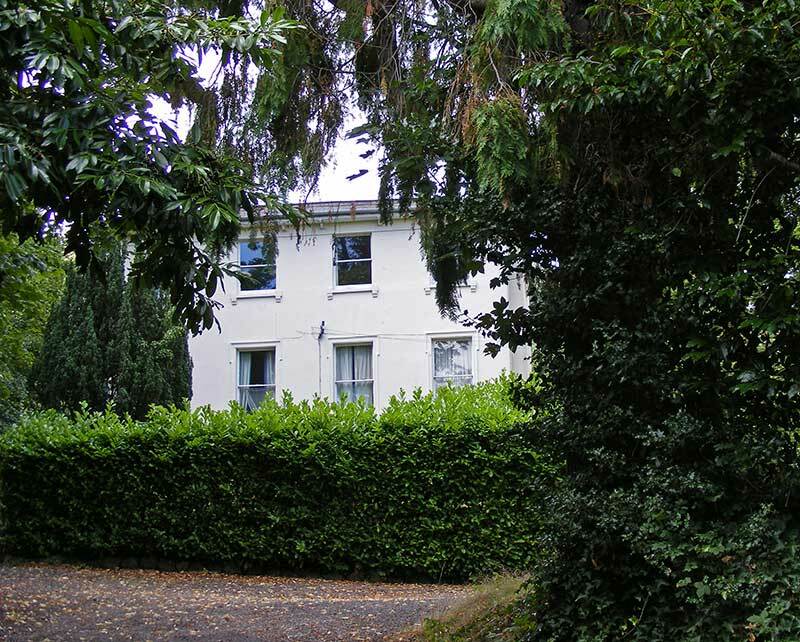 Glanelly is the property now named Rectory House, 26 Priory Road, which is largely hidden behind hedging. The 1911 census clarifies she was widow Mrs Elizabeth Cox aged 63 living with 3 unmarried daughters, born Malvern, a visitor, sick nurse and 4 servants. The house is described as having 13 rooms. 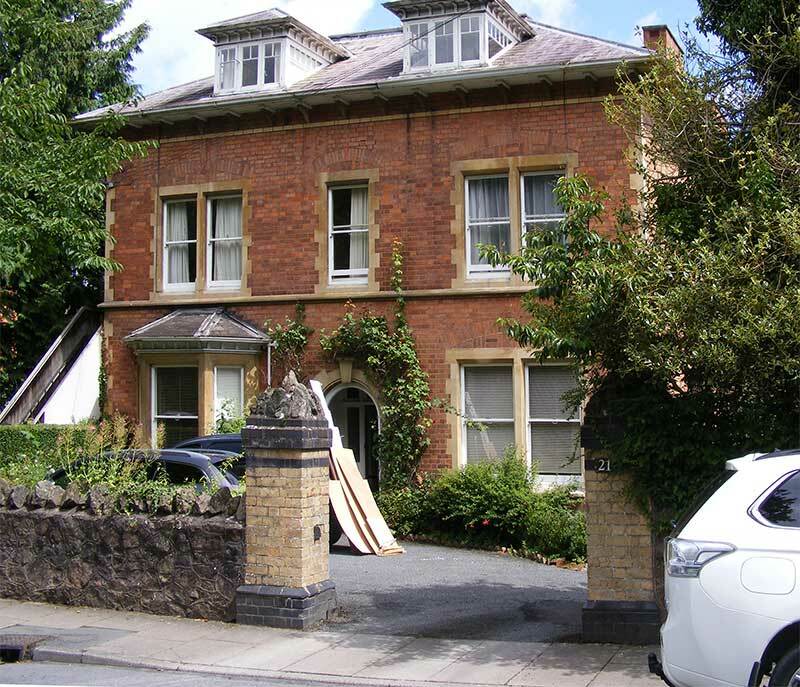 Her husband Thomas, a silk mercer, had died in 1888 when their children were small, just a year after his father who had lived at Marienburg House in Great Malvern. Next come two blocks of modern flats named Priory Court, 28 and 30 Priory Road. The original properties built on this land, Clydesdale and Bryndart, have been demolished. By 1940 Bryndart had been renamed Musgrave when solicitor Charles Francis Kilner Mellor, and a Mrs Toppin were in residence. Charles died at Manby Lodge in Avenue Road in 1961, while Daisy Toppin died at Musgrave on 20th June 1967. 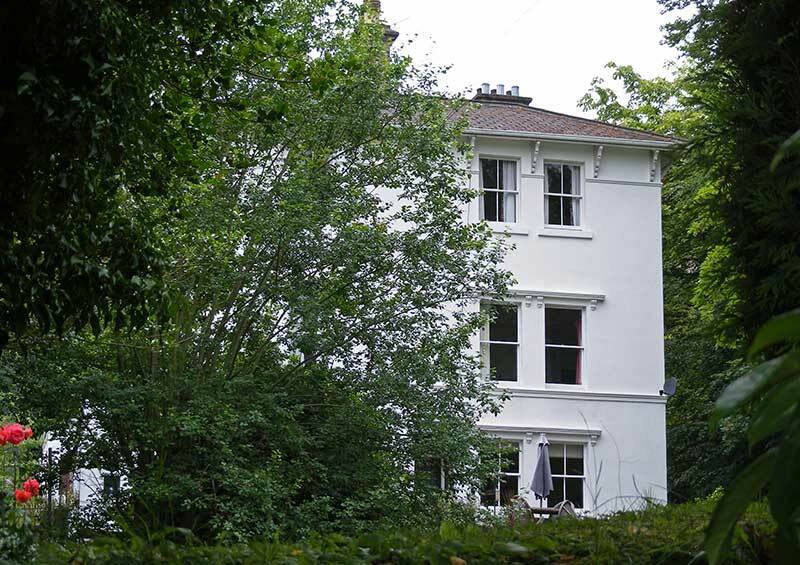 Portswood is a property of character and one of the oldest in Priory Road. Rev John William Augustus Taylor is said to have run a preparatory school there between 1853 and 1858. Mary Simpson was the second wife of Francis Simpson, a man of independent means, who was the grandson of John Simpson a non conformist minister and religious writer. Francis Simpson died in 1903 and is buried in the churchyard of St Mary Guarlford, as are his wives Alice died 1878, and Mary died 1927. An excellent book has been written about the property recorded in the 1911 census as St Clare (ref 2). Apparently the house started life named Thorpe House in 1853, shortly after it was renamed St Clare in 1856; traces of that name can still be found on a gatepost. After WWII St Clare became in turn, St David's Hotel, The Clans Hotel, Hotel St Clare and in 1972, Tower House. Medical practitioner Charles Harry Hanger East was a nephew of the Victorian landscape painter Sir Alfred Edward East (1844 - 1913) who in 1906 was elected president of the Royal Society of British Artists. One of his roles seems to have been as medical officer for Lawnside Girls' School in Albert Road South. Madame Laura Robinet, who was a principal of the school in 1911, was the wife of French painter Paul Robinet. St Clare was demolished in 1988, and in 1999 work began on a magnificent block of apartments now known as Priory Gardens. St Ronans was built of brick, about 1856, by George McCann for a Joseph Wilton. Unlike other houses it has retained its original name. Much of the building is hidden behind shrubbery, but the glimpse below shows St Ronans has some interesting features. 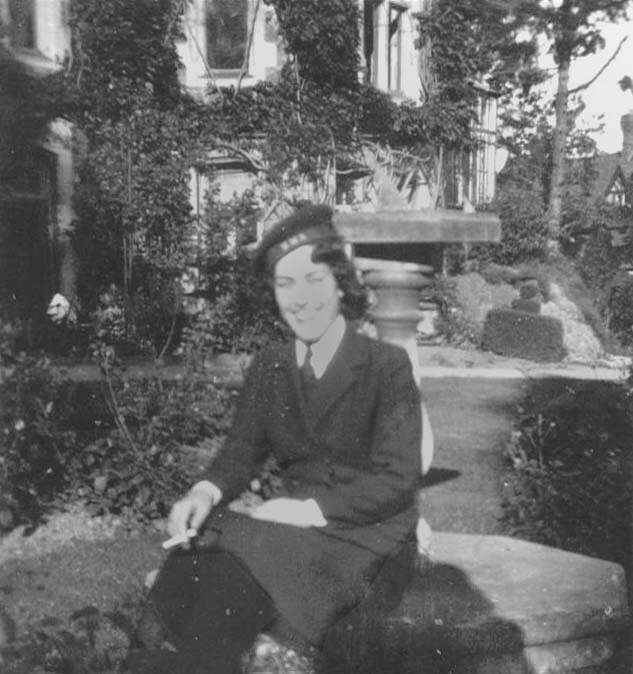 Born Alice Gray Elmslie, a cousin of the architect Edmund Wallace Elmslie, she was the widow of banker Christopher Dove Barker; the couple had lived previously at Radnor House in College Road. Their daughter, widow Mabel Gray Momber, married second widower Charles Harry Hangar East MD of St Clare in 1916. The house named as Lystonville in the 1911 census is now number 38 Priory Road. We did not take a photo as the property is largely hidden behind trees. 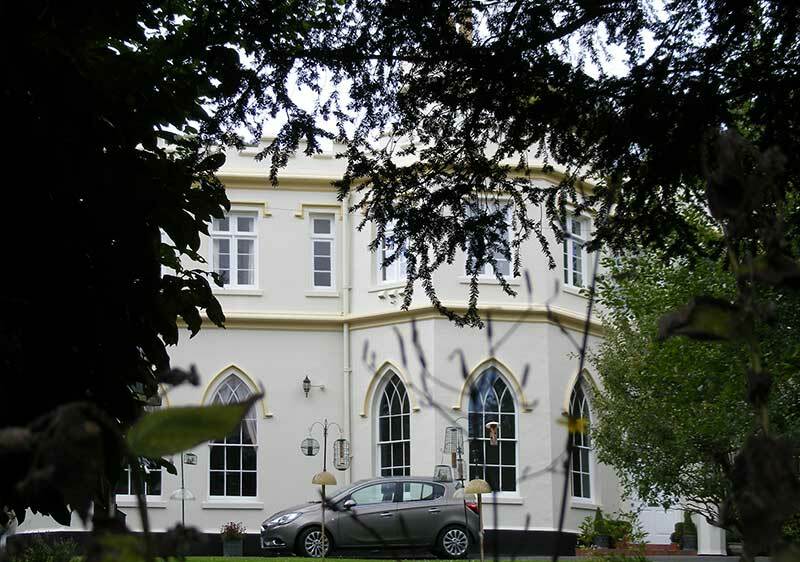 When it was built about 1854 the property was named Chalford, changing to Lystonville or Lyonsville about 1884, and in the 1960s to the Bay Tree Hotel (ref 2). The house is now divided into flats. In 1911 the property was described 'To Let'. This could be the house later named Aylesford, occupied in 1940 by Lt Col Edward Clifford Bullock, MA, TD, DL, JP. Edward Clifford Bullock, born Lincolnshire 1866, was the son of a clergyman, educated Malvern College and Oriel Oxford. He became a Captain in the 1st Worcestershire Volunteer Artillery; besides teaching he was an officer with the Malvern College cadet force and served in France during the 1914-1918 war achieving the rank of Lt Col. He was awarded the Territorial Decoration (TD) for long service and in 1929 became a Deputy Lieutenant for the County of Worcestershire. Latterly of Aylseford in Priory Road, Malvern, he died at Worcester Royal Infirmary in 1954. 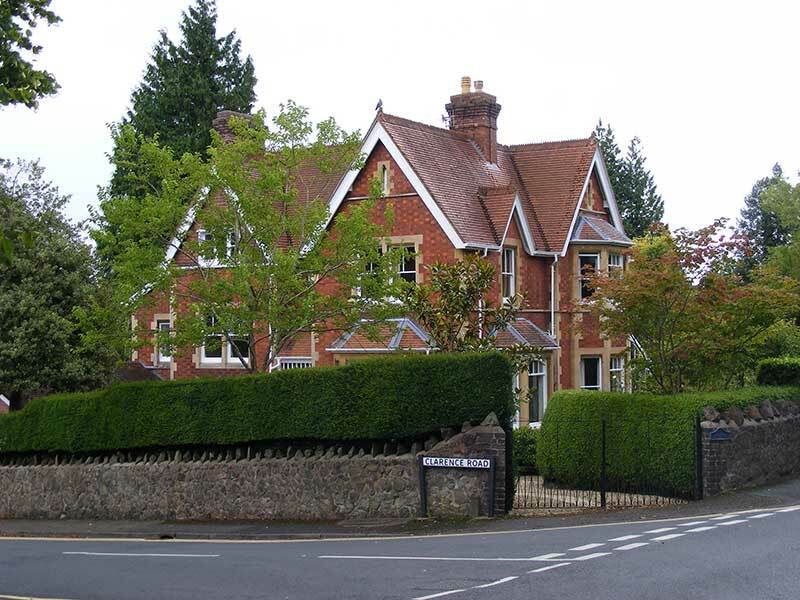 The property named as Southbury in the 1911 census was built about 1861 when it was first named Tibberton House. About 1903 the name changed to Southbury (ref 2). 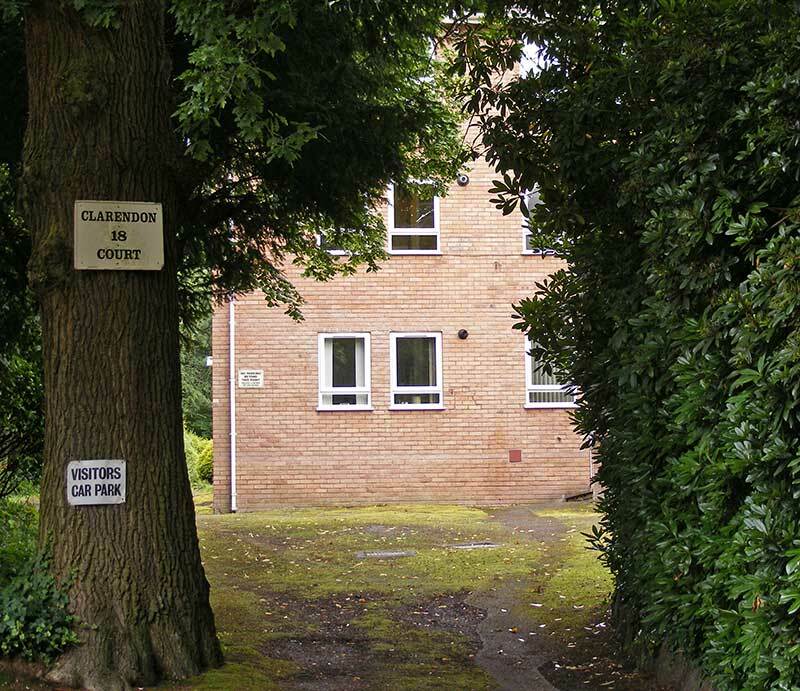 The property appears to be divided into flats; a faded board on the gate post suggests that it is now simply known as 40 Priory Road, although a list of council tax bands records the property as also named Priory House. Circa 2013 accommodation was advertised at this address under the guise of the Russeldene Hotel or Guest House. Rev Arthur Hoste, priest, was born Norfolk in 1857 and died at Malvern in 1932. He was the son of Rev James Richard Philip Hoste who in 1881 was rector of Farnham. Vicar of Chaddesden Derbyshire (1896 - 1902), vicar of Campsall, Yorkshire (1902 - 1909). He resided in Great Malvern at Southbury from 1910 until his death. In 1940 Captain John Edward Hance was in residence who, according to a Civic Society plaque on Park View, ran a riding academy in Church Street. It is not obvious now where that was, but Brian Iles relates that Buchanan Livery Stables and riding school run by Capt Hance was approached by an archway in the middle of Spark's ironmongers shop on the corner of Church Street, since demolished. Subsequently Woolworths occupied the site, and after that a store named Iceland specialising in frozen food. Capt Hance's riding school was recorded in trade directories from 1924 to 1932. Another establishment was The Avenue Riding School at Barnard's Green run by E H Humphris. If we have it right, John Edward Hance was the son of a draper born at Fleetwood on the 6th May 1887. In 1915 he had been a riding master in the Royal Artillery. He died at Midhurst Surrey in 1964 and was survived by his younger brother Arthur Leonard Hance. 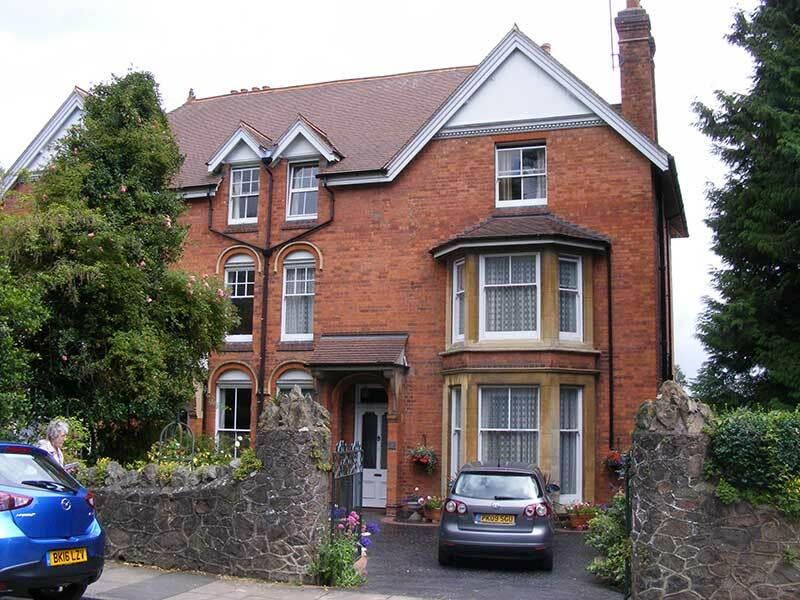 In 1911 the Vicarage was an imposing villa standing near the junction with Orchard Road. The property first known as Osbourne House was built about 1854, becoming the Vicarage circa 1884 (ref 2). 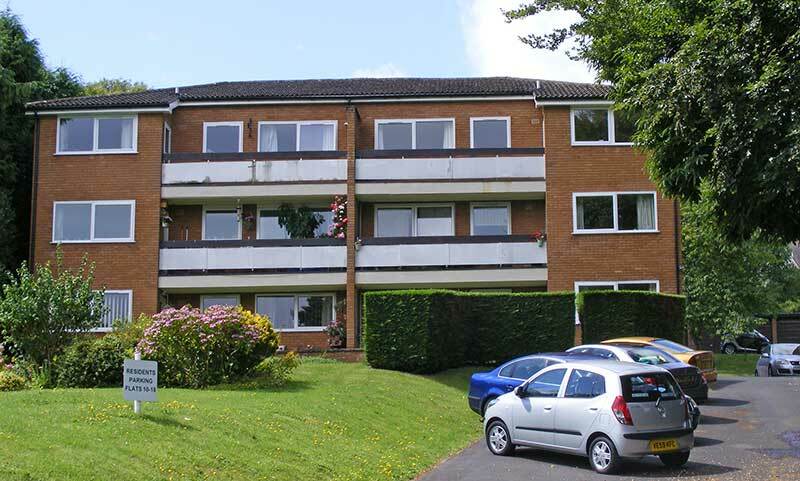 Nowadays it is a block of flats known as Lansdowne Court, 42 Priory Road. 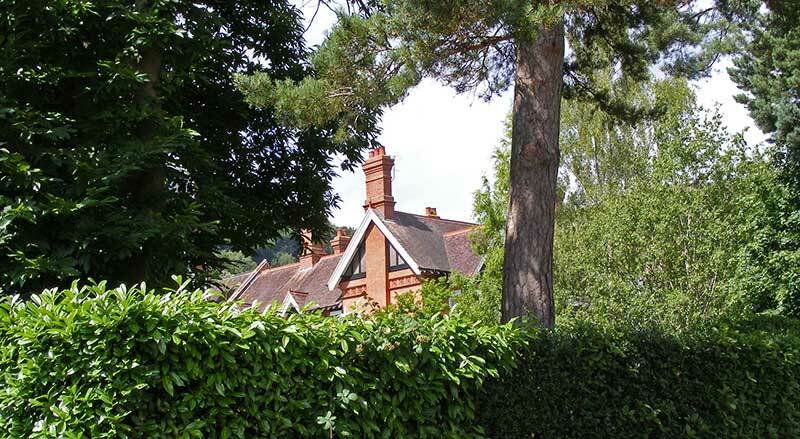 The present Great Malvern Post Office occupies the site of an earlier vicarage. 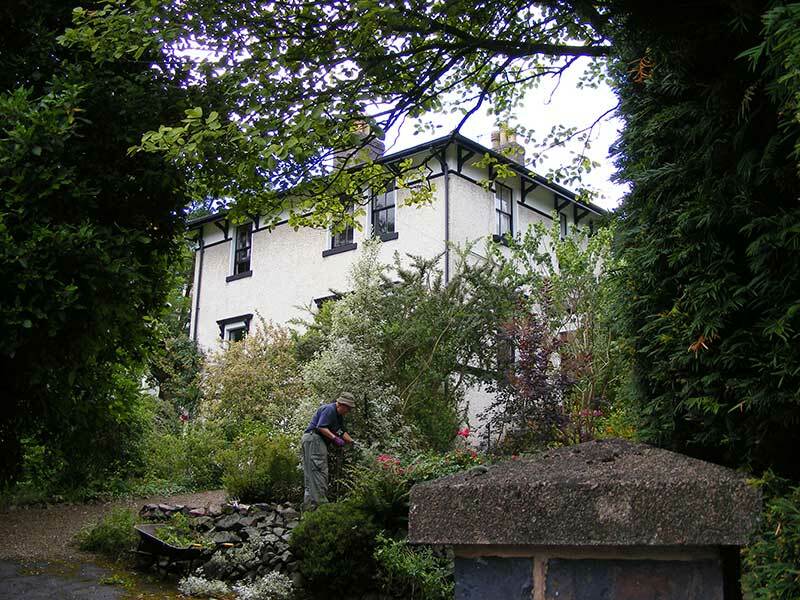 In 1911 the property was occupied by Rev Anthony Charles Deane, MA, Vicar of Malvern and Rural Dean of Powyke. In 1940 the Vicarage was occupied by Rev Hubert Humphrey Middlemore Bartleet, MA, vicar of the Priory church. 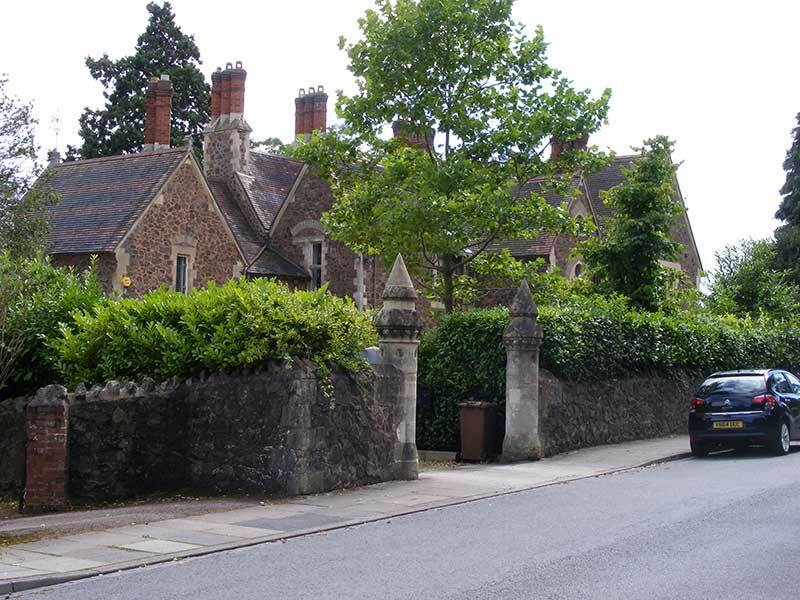 Nowadays the Priory's vicarage is located near the junction of Clarence Road and Tibberton Road. In 1948 Douglas House School opened at the old Vicarage; the Principal was then Mrs Owen-Williams and there were 12 pupils. 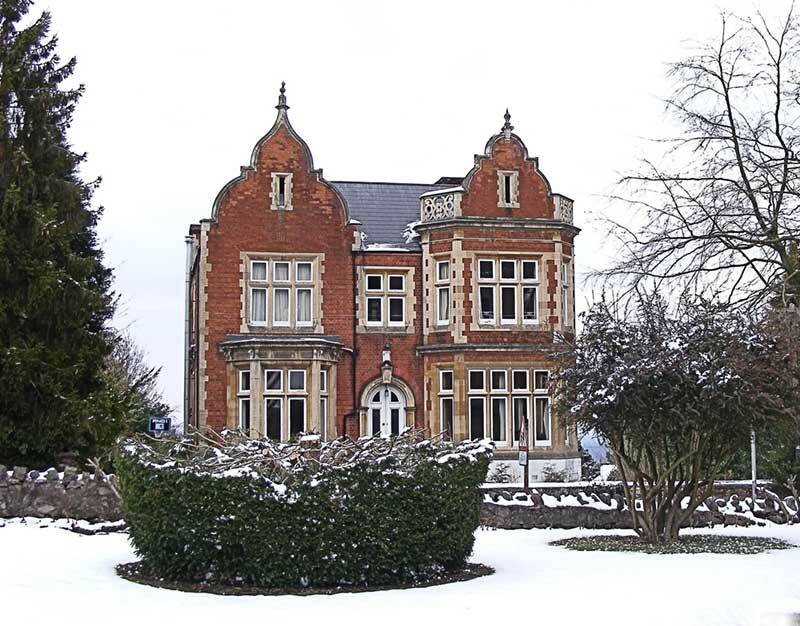 By 1950 numbers had grown to 37 and the school moved across the road to 'Prior's Mount' an imposing Victorian residence, which during WWII had been a Royal Navy mess for officers of HMS Duke. About 1950 the Vicarage became the Osborne Hotel. Roy Philpotts relates that the owners' son had been badly burnt in a plane crash during WW2 and servants slept in the attic (ref 3). Can you tell us more about those days? 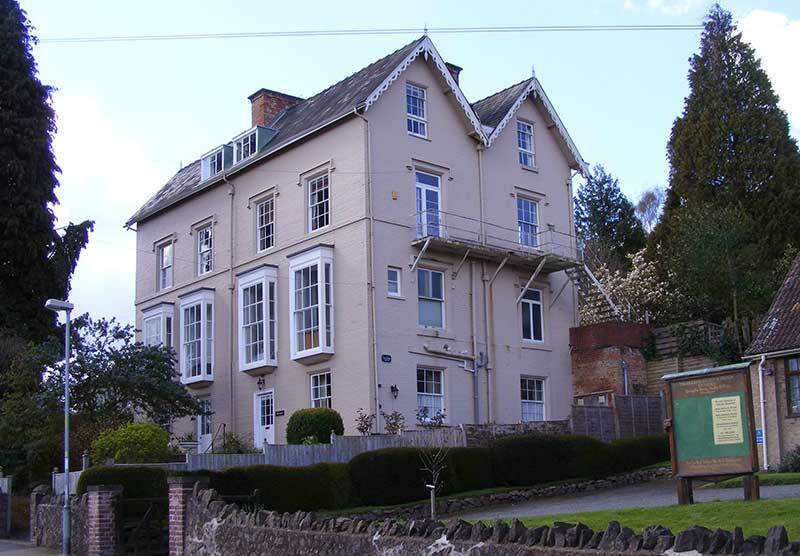 Cleveland House which stands next to the old vicarage was built about 1861. About 1950 it became the Sherrington Hotel and now it is a block of apartments known as Sherrington House, 44 Priory Road. A biography of Harry Arbuthnot Ackworth can be found in our article about Great Malvern cemetery. Sadly two of his sons would perish in the Great War. An 1884 map of Great Malvern shows two connected properties on the other side of the junction with Orchard Road known as Huntingdon Villa and Dalvey. Stevens 1901 Directory records Huntingdon and then Dalvey in Priory Road, but the 1911 and 1940 directories simply record Dalvington, a combination of both names, suggesting to us that the properties had come under common ownership. Stevens 1911 Directory records the occupant of Dalvington as - Price, P A, apartments; later in 1940 Mrs M B Barnard, apartments. Scientists from TRE probably lodged at Dalvington during WWII. Later Douglas House girls' school acquired Dalvington to house boarders. It looks as though Dalvington has been split up again as next come Dalvey House, and South Dalvey, 46 Priory Road. 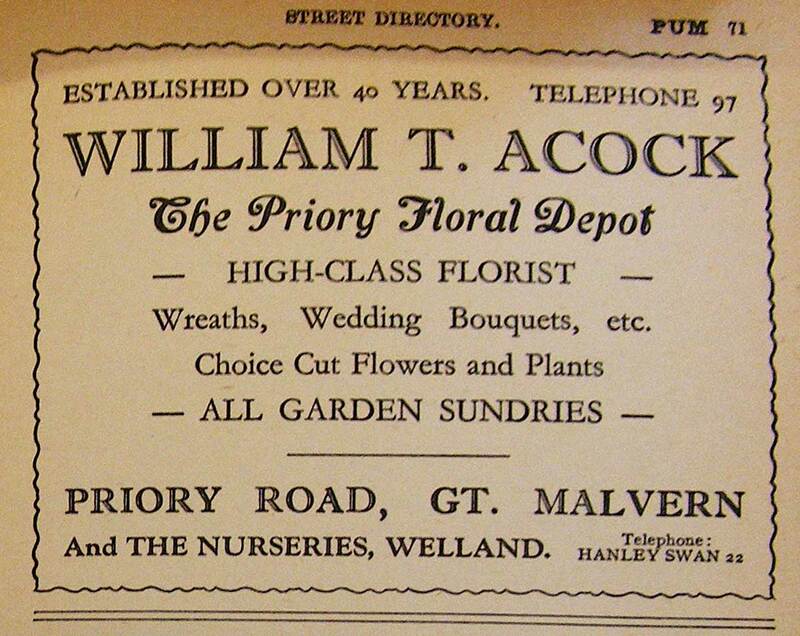 In 1940 the occupier was his son Acock, William Trower (nurseryman). Two modern houses now occupy this land. The son of Mr William Trower Acock, Mr Acock grew up with a love of cars. His parents were among the earliest car owners in the county, in the days when a pedestrian with a red flag had to walk ahead of the vehicle. His mechanical interests were further whetted by his experience in the Army Service Corps in German East Africa during the First World War. On his return to England, he joined Woodyatts Engineering, where he stayed until 1929, when he and John Bowman formed their own firm, which was originally based in Newtown Road. After ten years, it moved to the corner of Worcester Road and Howsell Road, where its specialist engineering services were much in demand during the Second World War. Among the work personally carried out by Mr Acock was the preparation in 1940 of the discharge nozzle for the prototype Whittle jet aero-engine. Mr Acock was perhaps better known among local people as the man whose skills kept essential vehicles, such as ambulances and doctors' cars, going through the War. Near the junction with Abbey Road, on your right, is a large Victorian Grade II listed property with a castellated porch named Priors Lea. Early-mid C19. Two storeys in stucco with hipped slate roof. Ends and centre break forward slightly with grooved pilasters with acanthus capitals. Band between storeys. Two windows, moulded surrounds with small cornice. Ground floor rusticated with one window and door and glazed sun porch on cast-iron columns with spandrels. Glazed gabled porch to right and 2 windows in wing of one storey, penticed. Priors Lea was once the nursery department of Croftdown girls' school across the road. The Red Door was the entrance to the upper class in the Nursery department. The fire escape doubled as an exit for classrooms on the front upstairs. The 'Tinies' were at the back of the house with safe entry onto the garden at the rear. In the 1970s the school was run by a Board of Governors with Mrs Portway-Fletcher as Headmistress. A wrought iron pedestrian gate (left out of picture) leading to the red door on the first floor incorporates the name 'Wingletang'. A strange name, possibly after Wingletang Down on the Isles of Scilly. Apparently there is a Wingletang garden railway near Leigh Sinton. Strangely Priors Lea is not shown on the 1884 map of Great Malvern, unless it is the property marked as Abbey Villa a little further along Abbey Road. Nor is it listed in Stevens Directories of 1901 and 1911, so we wondered if the house may have originally had its entrance on Abbey Road. In 1940 the occupier of Priors Lea was Mrs Holbeche the widow of Dr Arthur Oliver Holbeche LRCP, MCRS who had died at his home Priors Croft on Christmas day 1931. His obituary appeared in the BMJ on March 26th 1932. In 1911 he had spoken well of the new hospital in Lansdowne Crecent, founded by C W Dyson Perrins and during the Great War he had attended the Voluntary Aid Detachment hospitals in Malvern. Here Priory Road joins Abbey Road, and we turned round to record the houses on the other side. 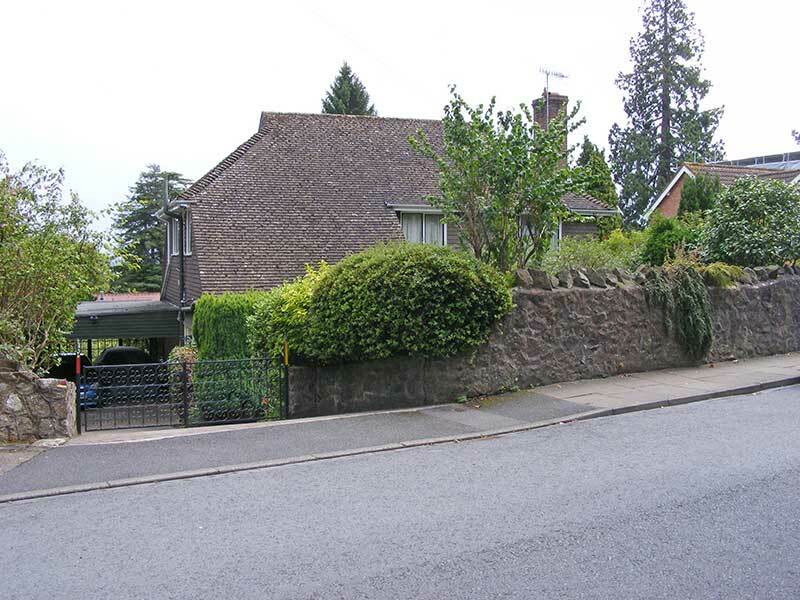 The houses opposite, numbers 39 and 37 Priory Road, are hidden from the street by a tall hedge. Number 39 possibly modern infill. Early-mid C19. Two storeys in stucco with hipped slate roof. Ionic pilasters mark the bays of 3 windows, stucco surrounds with aprons, hung sashes with glazing bars. The main elevation to the side has a full-height gable breaking forward with one window over doorway which has cornice on consoles and radiating fanlight to 3-panel door. Two bowed windows to ground floor, hung sashes with glazing bars. Plinth. Three windows to 1st floor, with aprons and band at cills. Lower extension to right. In 1911 the occupier was listed as Page, Miss E. In 1940 the property was occupied by: Charles Robert Paterson Mitchell, MD, ChB, physician and surgeon and medical officer to the Urban District Council, who died at Southfield House on 10th December 1942. St Edmunds Hall, on the corner of College Road and Priory Road was built as a Roman Catholic church. The beautiful church of Our Lady and St Edmund was officially opened on 6th October 1905. 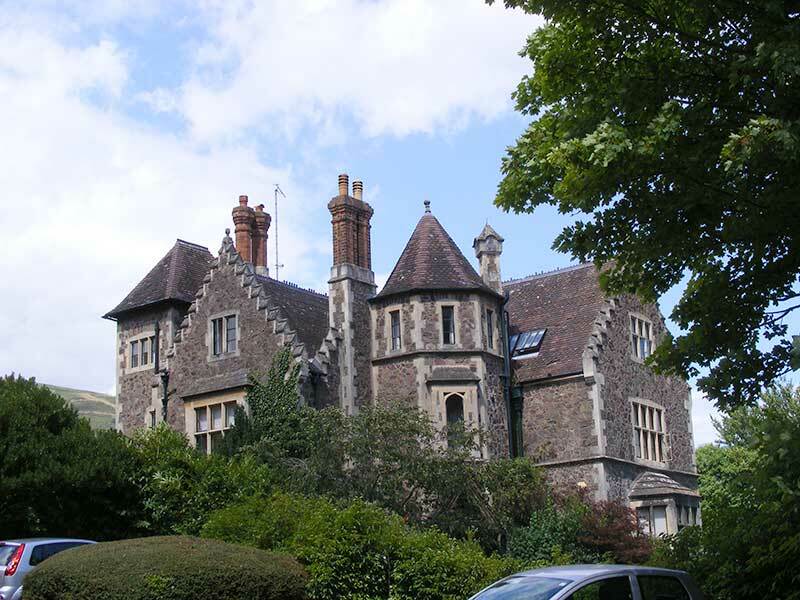 It was designed by Peter Paul Pugin and built by Messrs Broad Ltd of Malvern. Here Free French cadets visited during WWII and a roll of their Fallen can be found in the building . The church closed for financial reasons in 1996 and the building is now owned by Malvern College. Next below St Edumunds once stood a large mansion named Priors Mount built about 1854; on an 1884 map of Malvern it had been marked 'The Slopes'. During WWII the property was requisitioned as a Royal Navy Officers' Mess for staff working at the shore based training establishment named HMS Duke in St Andrew's Road. It has been suggested that WRENS may have had lodgings opposite at St Clare. Anne Pitman very kindly sent the above photo and those below from the album of her aunt Miss Hannah Mary Palmer, known as Molly, who had been stationed at Priors Mount during WWII (ref 4). Molly is on the right of the picture in the front row. 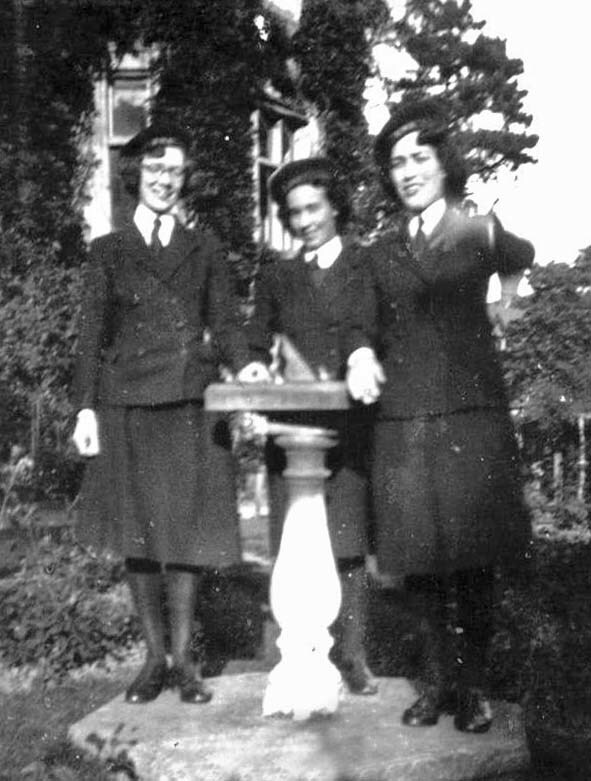 After the war, in 1950 Priors Mount was acquired by Douglas House girls' school. 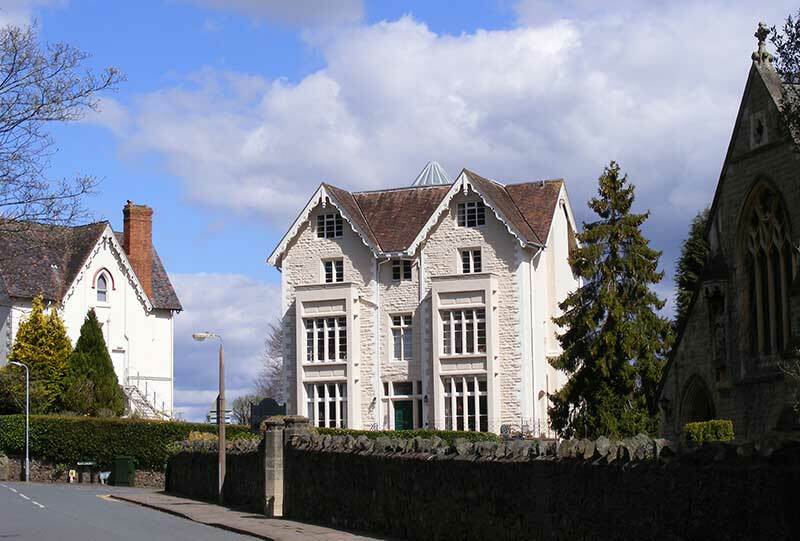 Douglas House closed in 1970 and was acquired by Malvern College under whose ownership Prior's Mount was demolished in order to build the Lindsay Arts Centre, named after former headmaster (1953-1971) Donald Dunrod Lindsay CBE, who was chairman of the Headmasters' Conference in 1968. In 1911 Rev Cecil Joseph Jones aged 37 was in residence, with his wife, 2 young children and 8 servants. The house was described as having 26 rooms. Rev Cecil Joseph Jones was the nephew of John Joseph Jones of Abberley Hall who had inherited a fortune from his cousin, Oldham born Joseph Jones (1817-1880), a coal, cotton and banking magnate. 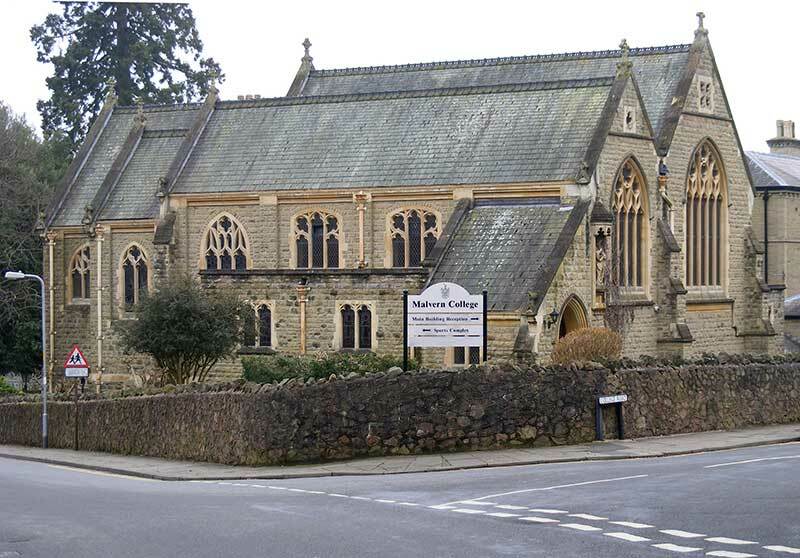 Rev Cecil Joseph Jones was educated at Malvern College and Brasenose, Oxford, and died at 'Franche', a house in Tibberton Road, in 1938. 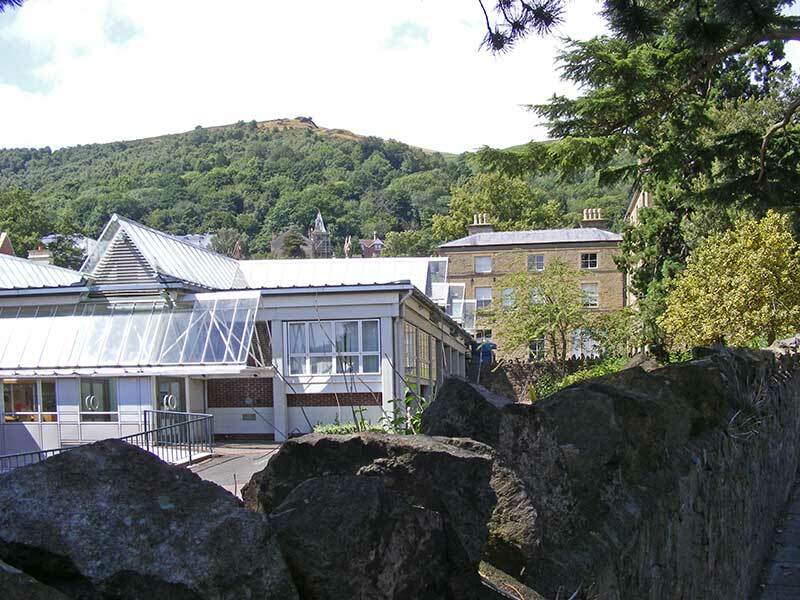 From near here, Malvern College can be glimpsed to the south of Priory Road. Next stood a nice half timbered stone house named Winstanley which was demolished in 1988 to build a large block of flats named Crellin House - described as a development on one and two-bedroom retirement properties with communal facilities close to shopping and within walking distance of the theatre. 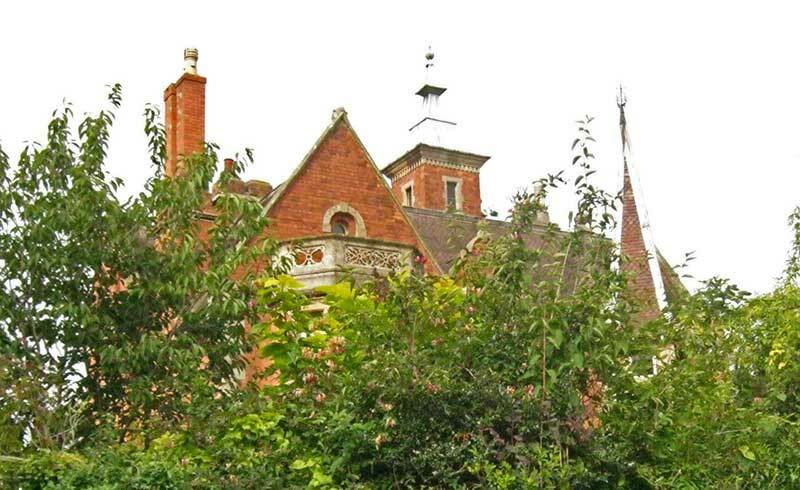 Winstanley had at one time been used as a boarding house and head teacher's residence for Douglas House Girls' School; latterly it was said to have suffered badly from subsidence. In 1940 the occupier was Herbert Stringfellow Pendlebury, MA, MB, B Ch. Herbert Stringfellow Pendlebury FRCS was a consulting surgeon at St George’s Hospital and then of the Royal Waterloo Hospital in London. His wife Lilian Dorothea was the daughter of Sir Thomas Lane Devitt, 1st Baronet, and Chairman of Lloyd’s Register of Shipping; she died in 1921, and in 1925 Herbert Pendlebury married second Mabel Webb, daughter of Mr Richard Webb of Wanganui, New Zealand. His son archaeologist John Devitt Stringfellow Pendlebury was sadly a casualty of WWII. You will find his adventures on the Winchester College website, which read like a story from Evelyn Waugh's novel Unconditional Surrender. Click to go to biography of John Pendlebury. 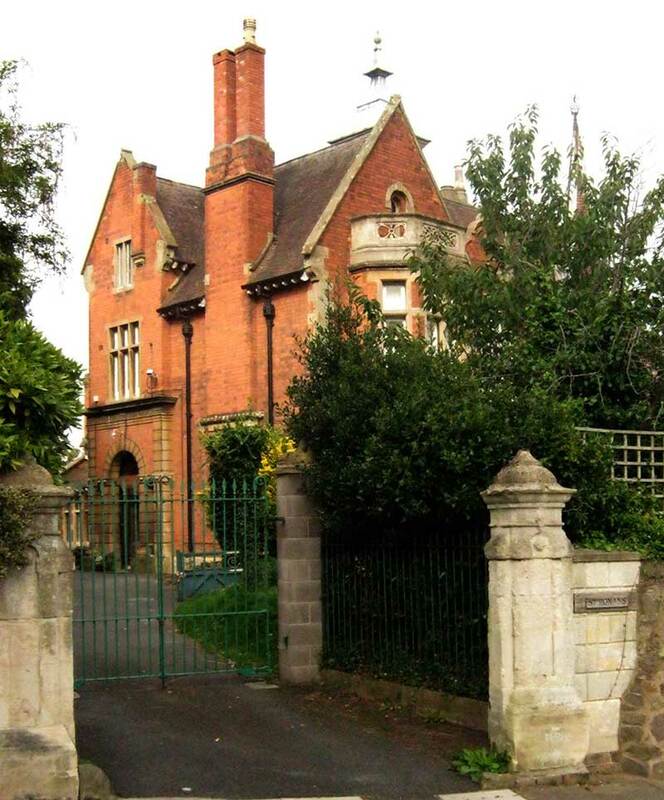 On the other side of the junction with Woodshears Road is a stone property named Daresbury, perhaps one of the oldest and finest buildings in Priory Road. The 1911 census recorded the occupier as James Mackenzie, aged 69, a gentleman of no occupation and private means, born Stornaway Scotland; married 33 years, 4 children, 3 living. James and Jane MacKenzie had two sons whose names are recorded on Great Malvern Priory's War Memorial. Captain Eric James Bethune Mackenzie 29th Battery, 42nd Brigade, 3rd Divisional Artillery, Royal Field Artillery, BEF was killed in France two years later on 8th July 1916. They had both attended Tain Academy in Scotland; Keith went on to Malvern College. Both men had married. Eric left a daughter Alice Frances Fleming MacKenzie born 1911 who married Charles Allarton Milward - son of Lawrence Sydney Milward a mathematics teacher at Malvern College who is buried in the churchyard of St Mary Guarlford. Click to read more about James MacKenzie and his family who could have moved to Daresbury as early as 1892 when James eldest son Keith became a day boy at Malvern College. 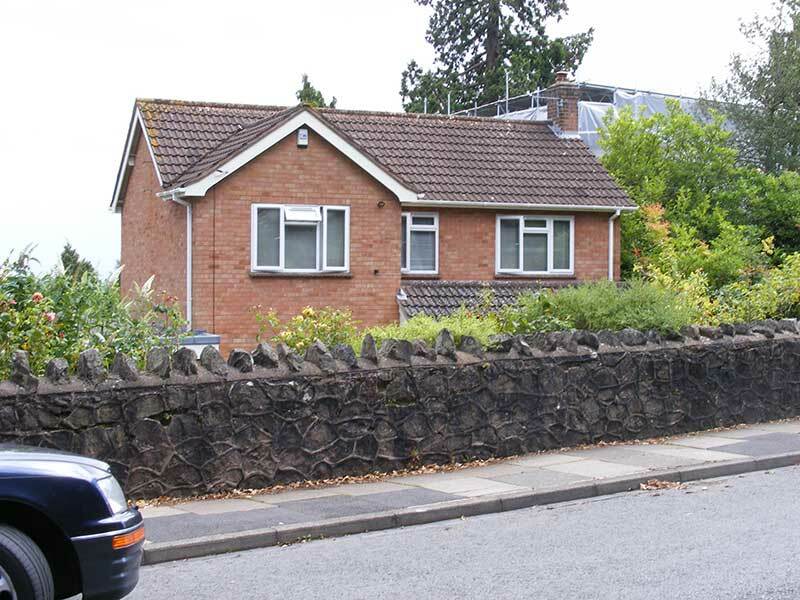 Next after Daresbury come two modern homes numbered 25 and 23, set below Priory Road, modern infill. In 1911 the next property listed after Daresbury was Hatfield. We cannot discount that Hatfield was demolished and numbers 23 and 25 built in its place, but we wonder if Hatfield was the property now numbered 21 Priory Road, which has fire escapes either side. When we visited there appeared to be some refurbishment going on. 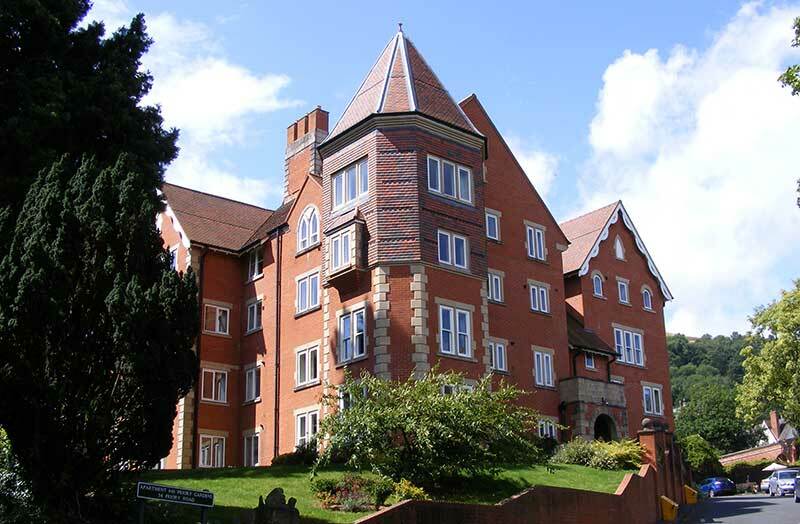 In 1911 Hatfield was a Nursing and Nurses' home, with Miss Beaumont listed as superintendant; by 1940 Hatfield had been renamed Brightside with the occupier listed as Miss E Horbury; in the 1960s Brightside was listed as a nursing home. 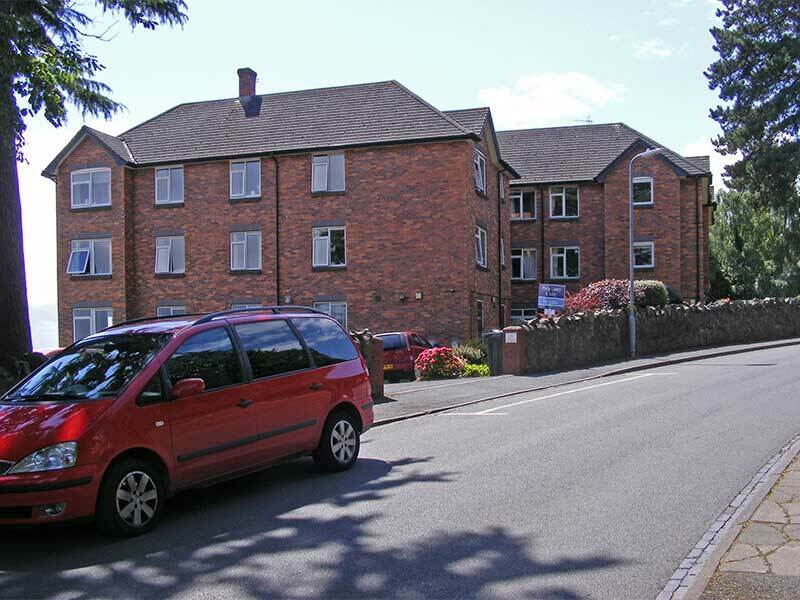 This could be the nursing home where Philip Nicholls, a pupil of Southlea prep school sadly died, aged 11 years, on St Matthias Day 1918; he is remembered in a plaque in Guarlford church and is buried at Wolverley parish church. Click to read more about Southlea school. In 1944 the Times announced the engagement of John Wheeler-Bennett, whose widowed mother was at Brightside, to Ruth Risher of Charlottesville, Virginia USA. Historian Sir John Wheeler-Bennett GCVO, CMG, OBE, FBA, FRSL, educated at Malvern College, died at London in 1975. Next come a pair of semi detached properties. If Hatfield still stands and is now numbered 21, then the right hand semi would have been named St Audrey's, later changing to Chilliswood. 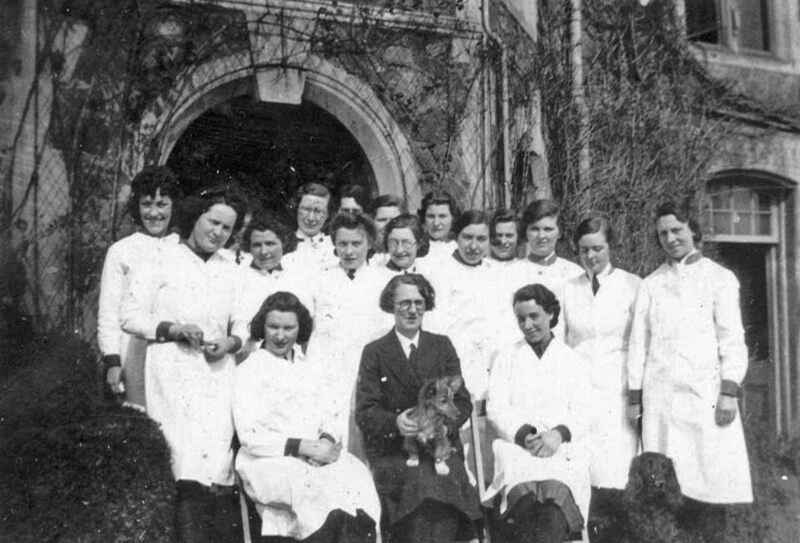 By 1940 St Audrey's had been renamed Chilliswood and the occupier was listed as Capt Bertrand L Secker MRCVS, veterinary surgeon. In 1940 the occupier was a Miss King. A descendant told us that Andrew King had married Emma Turner at Guarlford church in February 1867, and the couple had five daughters. In 1891 the family had been living at Abbey Terrace in Abbey Road; that seems not to exist now and we wondered whether anyone has a photo or can tell us exactly where Abbey Terrace was? Likewise what happened to Knotsford Lodge which we think stood close by. We surmise that the property at the junction with Clarence Road must be Linville, which is now numbered 15 Priory Road. In 1911 the occupier was listed as the Honourable Mrs Alexander. In 1940 the occupier of Linville was Major Herbert Denis Edleston Elliott (1887 - 1973) who had been a cricketer. In 1919 the London Gazette announced he was to be appointed Captain for service with and to command the Malvern College OTC. Passing by, in the summer, we noted that the house has a lovely well tended garden. At this point we arrived back at Southlea car park opposite the Splash leisure centre. 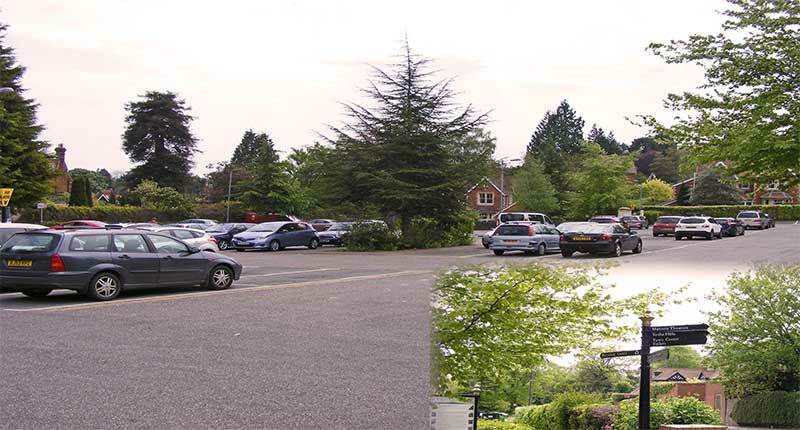 The car park was built on the playing fields at the rear of Southlea School. Click to read about Southlea prep school which closed before the second world war. Of course we may quite possibly have got the association between the old house names and modern street numbers wrong. Please do let us know if any corrrections are needed, you have better photos, or can tell us more about past notable residents.